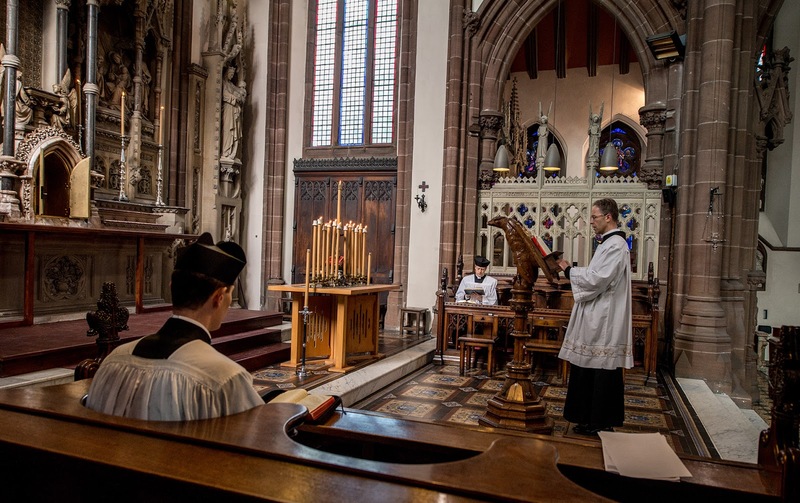 The Catholic Herald reported yesterday that ordinations will be celebrated in the traditional rite on June 17th of next year at the Fraternity of St Peter’s church in Warrington, England, St Mary’s Shrine. His Grace Malcolm McMahon, O.P., the Archbishop of Liverpool, will ordain Deacons Alex Stewart and Krzysztof Sanetra in the first such ordination ceremony to be held in England in decades. The FSSP took over the beautiful church of St Mary in Warrington, which was designed by Pugin, about 10 months ago, saving it from a proposed closure. It was established by Archbishop McMahon as a center for the celebration of the Mass and other sacraments in the EF, and has been embraced as such by the parishioners new and old. We will look forward to sharing photos of the ceremony with our readers next year, and we thank Archbishop McMahon for his paternal care of the faithful attached to the Extraordinary Form. The sanctuary of St Mary’s Shrine during Tenebrae this year. From our post this past June of the FSSP ordinations held in the Cathedral of Auxerre; the prostration of the ordinands at the Litany of the Saints.